Recently the Academy of Motion Picture Arts and Sciences announced that Puerto Rico would no longer be allowed to submit films for the Foreign Language film category. The Academy defines a foreign language film as a “feature-length motion picture produced outside the United States of America with a predominantly non-English dialogue track” (Rule 14). The Academy considers Puerto Rico inside the United States because of its status as a US protectorate. In response, the National Puerto Rican Coalition, Puerto Rico Film Office Management and Staff, Calle 13’s Rene Pérez, actors María Conchita Alonso, Yancey Arias, Miriam Colón, Esai Morales, Bertha Navarro, Celines Toribio, Benicio del Toro, Teofilo Torres, Jimmy Smits, Marcos Zurinaga and many other film industry leaders have signed a petition to reverse the decision, claiming the announcement is misguided and offensive. Since the Academy’s announcement, they have been bombarded with requests to see “America” compete in the foreign film category. Here is the issue at hand: the Academy says Puerto Rico is within the United States; its filmmakers claim they are outside of it. When it comes time to define Puerto Rico, where do we stand? Geographically we have a very clear picture. Puerto Rico is an island that lies between the Caribbean Sea and the North Atlantic Ocean, east of the Dominican Republic and west of the Virgin Islands, sitting about 5,000 miles away from the United States’ coastline. The island is approximately 100 by 35 miles and covers an area roughly three times the size of Rhode Island. The difficulty arises, however, when we try to examine its political and cultural identity – it seems to be caught in a semantic limbo. In some cases, Puerto Rico is recognized as outside of the United States. With an elaborate and unique history of its own, the island boasts a distinct culture and political climate much different than that of the United States. During the 1948 Summer Olympics, Puerto Rico debuted as a nation for the first time in an international sporting event. Since then, the island has had the choice of representing itself or the United States. 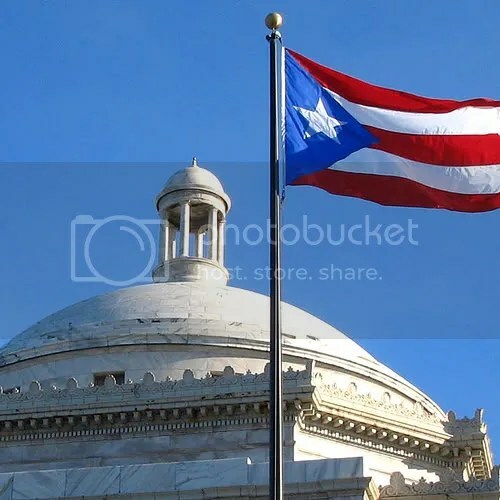 Additionally, when it comes time for the United States to file taxes, Puerto Rican motion picture production companies are conveniently considered foreign entities – or outside, if you will – and enjoy the added tax benefits of operating as a Controlled Foreign Corporation. In other cases, however, Puerto Rico remains very much inside the United States. As an unincorporated US territory, Puerto Rican’s enjoy US citizenship and a certain amount of federal funding from the US government. Puerto Rican’s even vote in Presidential elections. They send a representative to Congress – though s/he may not actually vote in session – and celebrate the 4th of July as a national holiday. Some might argue that this limbo Puerto Rico finds itself in is simply the result of “Commonwealth” status: unincorporated yet still dependent. While this may be the case, one cannot deny that this results in a conflicted political and cultural identity. Obviously one could venture into all sorts of political theories concerning Puerto Rico’s sovereignty, but most people do not have expertise in this field. Whether we realize it or not, many of us turn towards cultural institutions, such as film, sports, music, social media, literature, et cetera, for reference. How can we establish a strong Puerto Rican identity when the Olympic Committee acknowledges the island as its own nation, while the Academy does otherwise? This article is not attempting to solve the issue at hand. Fighting for the opportunity to submit for Best Foreign Film is only a snapshot of a Puerto Rico left in limbo. Instead, we can challenge ourselves to examine the relationship Puerto Rico has with the United States. How will our cultural institutions create a synchronized discourse that is accurate and authentic for Puerto Rico and its people? More importantly, what will be the American attitude towards this previously colonized island in the 21st century? If we cannot ask ourselves these types of questions, we risk looking at Puerto Rico as “Seen by the Half-Blind without Glasses,” and remain just as confused as The Academy seems to be.